I picked up these two strip cards this week for a total cost of $7. A bargain in my book. But when it came to deciding which to post, I had trouble selecting just one. Usually I'd choose the poorer of the two. Each have their qualities. I decided to post both. 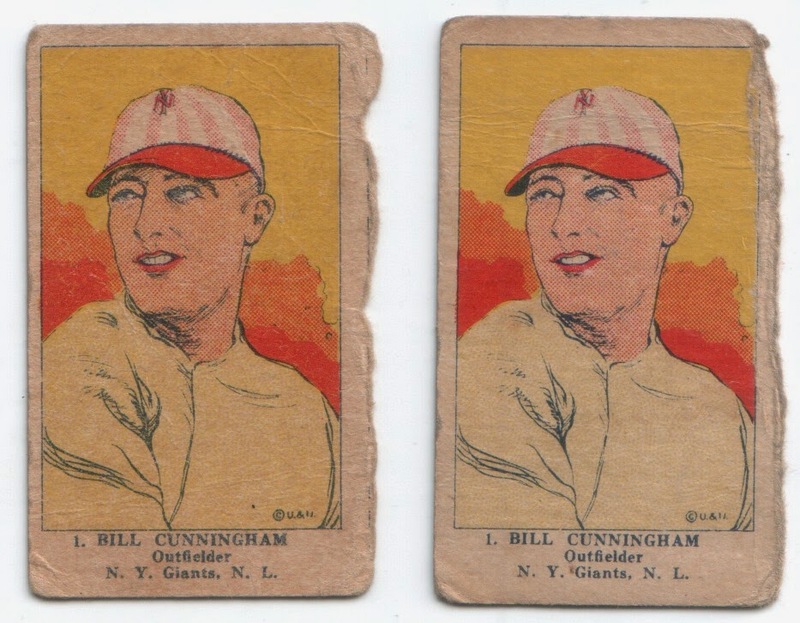 Bill Cunningham was one of those players who was obviously good enough to warrant a baseball card. But when looking up his bio, I couldn't find much. Sure, the basics are available: Throws right, bats right, plays outfield. A member of the New York Giants and Boston Braves. We know his birth and death dates, his stats and the fact he was a member of the Giants' world championship team in 1922. We know he was traded to the Braves in 1923 along with Dave Bancroft and Casey Stengel for Joe Oeschger and Billy Southworth. That's about all I could find. No info on his life after baseball. No funny stories. Not even an obituary. But he does have a few baseball cards. A lasting legacy for a man who played the game he loved. Thanks for sharing your great information please keep it up... Everything is helpful and important to find more topics.